Westwind shaper tips are made from hardened tool steel, but so are the razor blades you’ll use to shape the sides. When the tip is new, the shaping surface on the sides of the tip present a perfectly flat surface with squared corners. 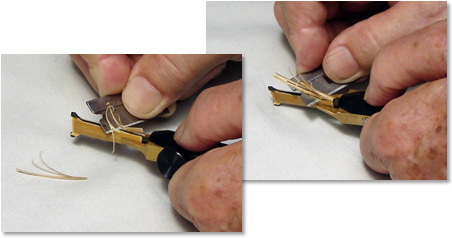 Keeping your blade horizontal to the profile edge will prevent the corners from becoming rounded over time. The flatter you hold the blade, the less likelihood there is that you’ll nick the profile edge and leave a small indentation. Our tips are made of the highest-grade tool steel and the ears get a special treatment to improve durability. If your tip ever breaks, we'll replace it. If you purchased it from our online store, email us at service@westwinddoublereed.com to make arrangements. If you purchased it through one of our resellers, return it to your reseller and we’ll work with them to exchange your tip for a new one.